Digital Mom Blog > blog > Kindle vs Nook – The Price War is ON! Kindle vs Nook – The Price War is ON! Let’s talk eReaders.. Do you own one? Kindle vs Nook – Forrester projected that the $150 price point would jump start e-reader sales. That price is just about here. Yankee Group estimates that 6 million e-readers will be sold in 2010. By 2013, 19.2 million e-reader units will be sold a year. Wondering if that includes iPad sales. As of June 2010, it is projected that 2 MILLION iPads have been sold. crazy. There once was an eReader called the Kindle. It was released by a company named Amazon, who controls the online ecommerce-land . It provided you a black and white way to read digitally. Seeing the direction of publishing, a brick and mortar retailer named Barnes and Noble developed an eReader called the Nook. The Nook was pretty. People liked the Nook because it wasn’t the Kindle and it looked shinier. Then one day, the all mighty brand above all brands named Apple decided that it wasn’t going to miss out on opportunity in the new digital publishing frontier. Apple waived their magic wand and produced a more than an eReader product called the iPad. With a silly name, a fancy setup and a high price – Apple was sure to beat up its competition (mainly Kindle and Nook). OH NO! What to do! Amazon and Barnes and Noble had no choice. They must fight to win and since they can’t produce a shiny product like Apple – they can win by lowering the price on their products. So just in time, before Apple launches a new product into the market place, Kindle and Nook went down in price. Display: 6? diagonal E Ink® electronic paper display, 600 x 800 pixel resolution at 167 ppi, 16-level gray scale. Size (in inches): 8? x 5.3? x 0.36?. System requirements: None, because it doesnt require a computer. Battery Life: Read on a single charge for up to 4 days with wireless on. Turn wireless off and read for up to two weeks. Battery life will vary based on wireless usage, such as shopping the Kindle Store and downloading content. In low coverage areas or in 1xRTT only coverage, wireless usage will consume battery power more quickly. Charge Time: Fully charges in approximately 4 hours and supports charging from your computer via the included USB 2.0 cable. Connectivity: EVDO modem with fallback to 1xRTT; utilizes Amazon Whispernet to provide U.S wireless coverage via Sprints 3G high-speed data network. Check our wireless coverage map for availability. This expanded coverage is only available for Kindle. See Wireless Terms and Conditions. USB Port: USB 2.0 (micro-B connector) for connection to the Kindle power adapter or optionally to connect to a PC or Macintosh computer. Content Formats Supported: Kindle (AZW), TXT, Audible (formats 4, Audible Enhanced (AAX)), MP3, unprotected MOBI, PRC natively; PDF, HTML, DOC, JPEG, GIF, PNG, BMP through conversion. Included Accessories: Power adapter, USB 2.0 cable, rechargeable battery. Book cover sold separately. Documentation: Quick Start Guide (included in box) [PDF]; Kindle Users Guide (pre-installed on device) [PDF]. Warranty and Service: 1 year limited warranty and service included. Optional 2 year Extended Warranty sold separately. So in our Kindle vs Nook talk, we looked at the Amazon Kindle, now Nook – it’s your turn. Connectivity: Free wireless from Barnes & Noble via AT&T, the nations fastest 3G network; Wi-Fi ( 802.11 b/g); Free Wi-Fi in all Barnes & Noble stores. Charging time: 3.5 hours from wall outlet, Charging via USB to computer system or power adapter. 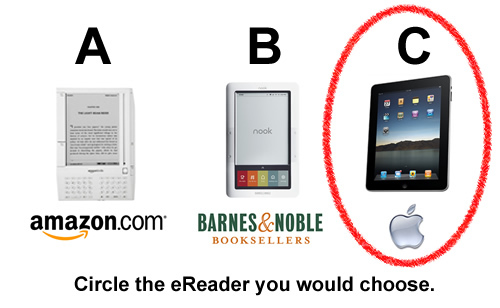 Which eReader do you – Kindle vs Nook or the iPad like and why? And words w friends is awesome! Holla if you need another friend to play with! shweet! please tag me up at digitalmom of wwf! — oh i can't wait to play on the ipad… soon, this mommy is saving her pennies..